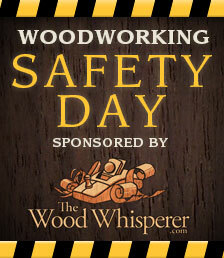 Safety Day is almost here! Safety day is Wednesday May 1st this year. What started out as a week long reminder of the importance of Safety in the workshop has come down to a single day full of articles and videos covering a wide variety of topics. But regardless of the breadth of posts and personal stories, the fact remains that safety is an every-day event. Not one that you should only think of once or twice a year. To help kick off the build-up to Safety Day 2013 I’m including this playlist of videos I’ve created over the past several years. I’m sure many of you have seen them before, but it never hurts to be reminded of a topic we all take seriously (even if my presentations aren’t all the time). Don’t forget to come back and visit on Wednesday when I release the full review of my experience with the SawStop cabinet saw. And what would a SawStop review be without firing off a brake or two? Matt, I really like your new site. What a big improvement! I just watched your sawstop video. I also have a sawstop, contractor version. I have no regrets at all, I really like it.